We are here to service all of your Marine AC, refrigeration and generator needs on boat and yachts. We have a “full service shop and mobile service van” helping customers from Georgetown, South Carolina to Wilmington, North Carolina. Our mission is to provide educated, skilled marine services and repair, at competitive rates with superior customer service. We operate with the principle of fair and honest work. We build relationships with our customers, not just one-time service. Call Southeastern Marine of the Carolinas today! Air Conditioning Repair — Air Conditioning service/repair will increase the comfort and usefullness of your boat and increase its value too. Typical service include flushing and inspecting the system, partial charge of freon, testing the system, operating pressures. All boats have air conditioning have one to multiple system should be inspected and serviced. 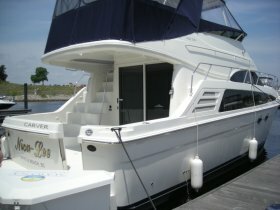 One of our specialites is adding heating/air conditioning unit(s) to the pilot house/helm area or outside seating area. This will add comfort, all year long. We have completed numerous custom installations that have met or exceeded our customers expectations. Call Southeastern Marine of the Carolinas today! Refrigeration is an important part of the any vessel environment. All vessels may have one to several refrigerators/icemakers on board. Southeastern Marine of the Carolinas is an authorized distributor for many of the common marine brands of equipment. Check out our refrigeration page for some of the models offered. If you do not see what you are looking for, please give us a call and we will find a solution to your refrigeration needs. Call Southeastern Marine of the Carolinas today! A Generator is an important part of your boating experience, it runs your electrical accessories, while off of dock power. Our highly trained and skilled technician can diagnose the issue, and in certain cases make the repair and get you on your way. Call Southeastern Marine of the Carolinas today!